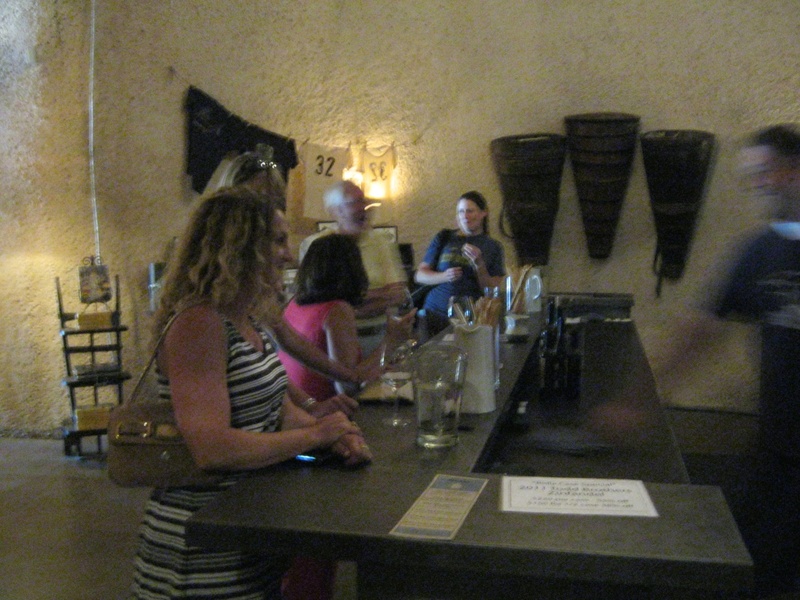 This trip we visited a large array of tasting rooms. Each and every one had developed a unique identity to help you remember them – farmstead, barrel tasting, wine cave, solar energy, organic farming, chocolate peanut butter cups with sea salt, refillable jug wine, retail store, creekside gardens, history, wacky antiques, and more. There have always been destination wineries that have included a restaurant, picnic areas, a retail component or some venue to attract and keep visitors at their facility for more than just the tasting. 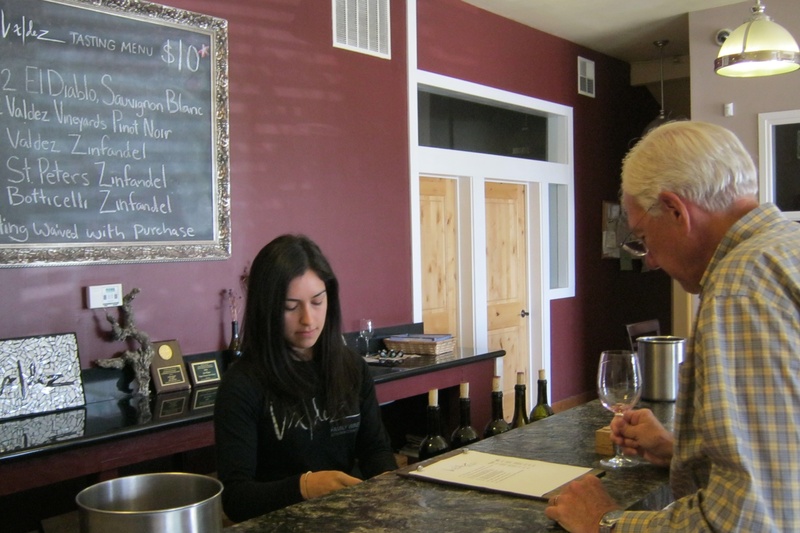 The American Dream – A Success Story – Valdez – Valdez Family Winery is on a side street in Healdsburg, off the square and if you visit Healdsburg – find it! Unpretentious in appearance but warm and welcoming. It is all about the wine and a success story that is quite outstanding. Ulises Valdez was16 when he came from Mexico to the U.S.. He began as an undocumented worker, obtained U.S. citizenship, rose to making his mark managing vineyards for Mark Aubert, JC Cellars, Paul Hobbs, Pahlmeyer, and Ram’s Gate and now also produces award wining wines. He started making wine in 2004 and his entire family has joined in to help with this rapidly growing business. Ulises daughter Elizabeth poured our tasting. Angelica, her sister, who is responsible for the marketing, was in the tasting room too and took the time to introduce herself. The passion these young ladies possess for the family wines is catching. Ulises Valdez produces Sauvignon Blanc, Chardonnay, Pinot Noir and Zinfandel wines while continuing to manage over 1000 acres of vineyards for others. 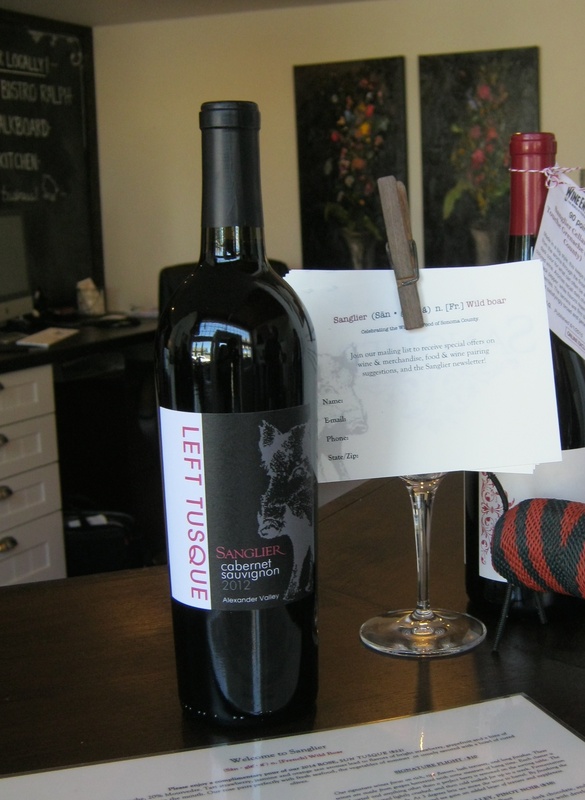 You can read more in Wine Spectator and SFGate about this well regarded man and his family. We almost didn’t make it to Unti and that would have been too bad. Carrie Mauritson recommended we stop there ( appointment necessary). 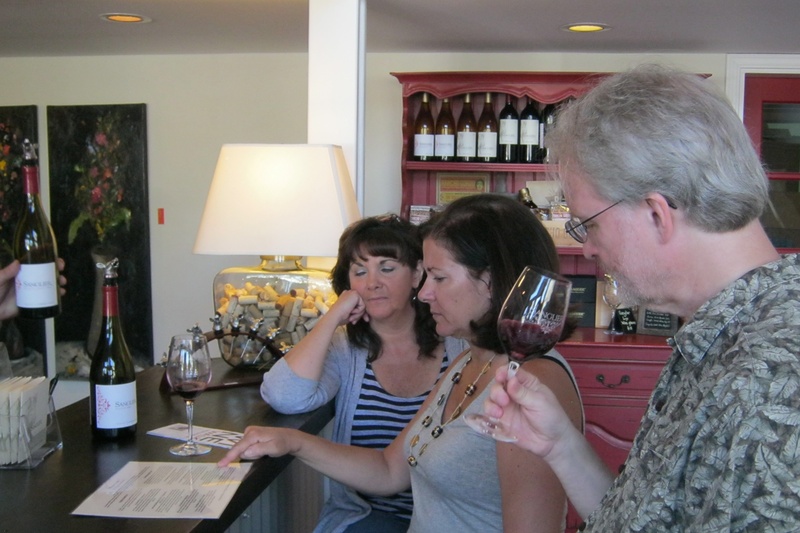 They schedule appointments a half hour apart to give the host and guest time to become familiar with their wines without the distraction of a full tasting room. 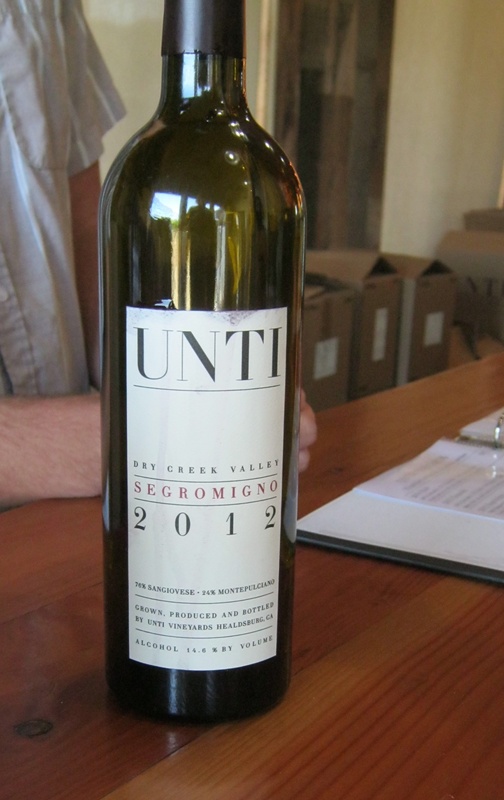 Unti is a small family winery that has been growing grapes since 1990. The have 60 acres at the site of the winery and another 25 acres across the road. 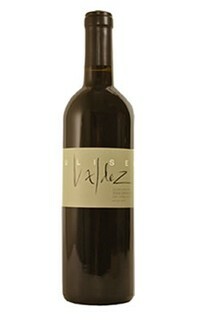 They describe their wines as “Mediterranean varietal wines with vineyard personality”. 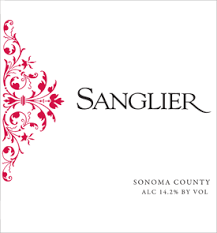 Sangiovese is one they are very proud to produce. They believe the 2012 Sangiovese may be their finest to date. Our host was a young UC Davis grad named, Kyle. He is looking forward to moving out of the tasting room and getting his hands in the grapes. 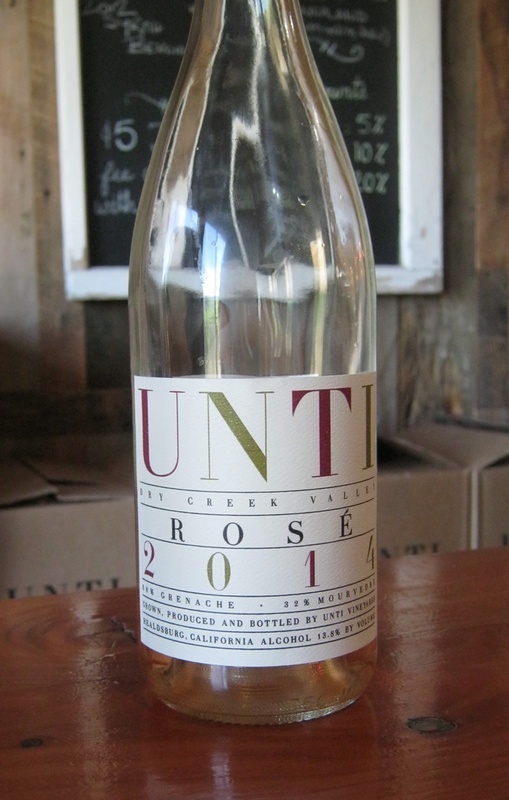 We tasted 2014 Rose, 2014 Cuvee Blanc, 2012 Segromigno, 2012 Zinfandel, 2012 Syrah, 2012 Benchland Syrah, and found the 2012 Zinfandel to be a favorite along with the 2014 Rose. Zichichi Family Vineyard is out on West Dry Creek Road. 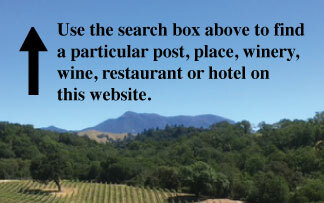 It is 18 acres of zinfandel and petite sirah vines, all located directly behind the tasting room. 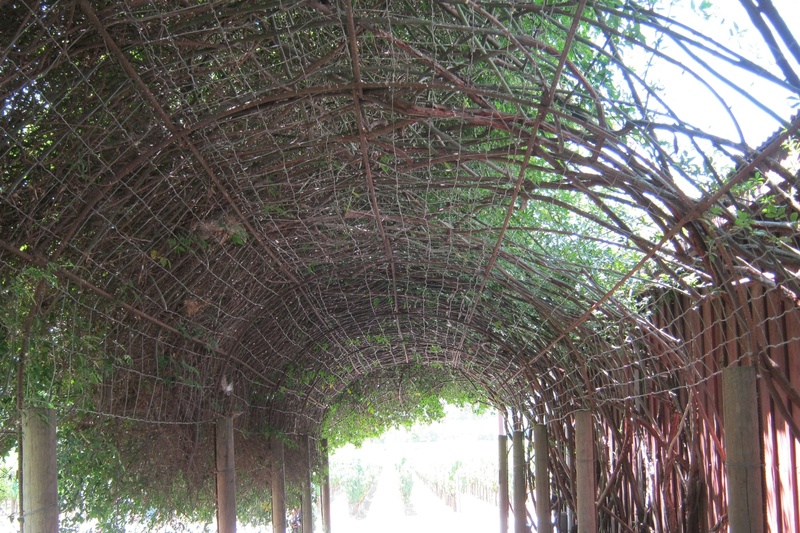 Some vines were planted in 1928, the rest in 1964. Zichichi wants you to visit and is very welcoming to guests but these days you won’t get to taste their bottled wines. They sell futures so their wine is often sold out before it is even bottled. 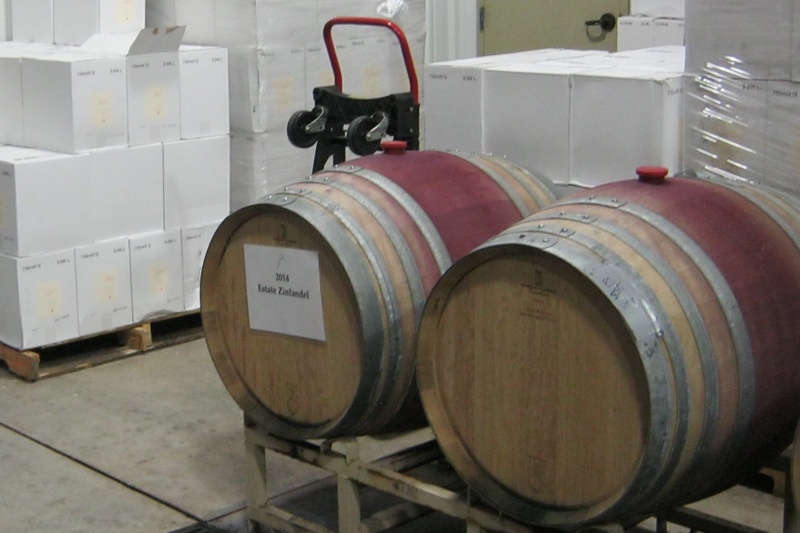 Currently you get a chance to barrel taste the wines that are offered for advance sales. 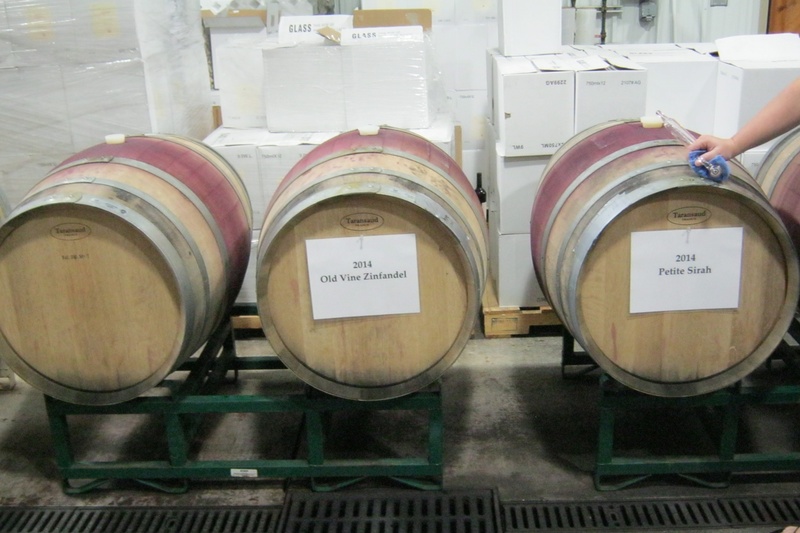 These are their 2014 Estate Zinfandel, Estate Old Viine Zinfandel and Estate Petite Sirah. You feel as though you are entering a farm when you visit Preston’s tasting room. Preston is actually just that – an organic farm and wine is one of many products they proudly produce and sell here. On Saturday’s they bake fresh bread and on Sundays, for locals, they offer the chance to get their “jug wine” refilled. The facility has a gracious backyard for picnicking with at least a couple of barn cats roaming the farmstead. 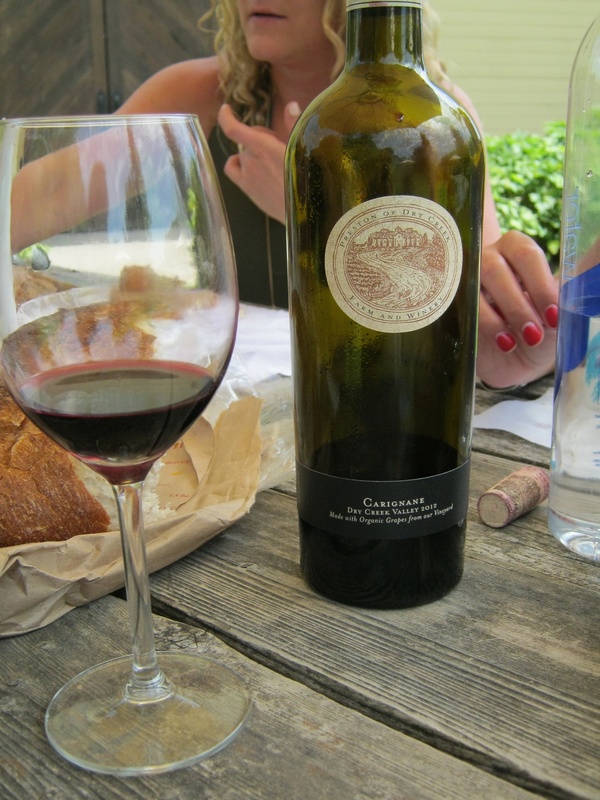 We took advantage of the picnic grounds, relaxed and shared a bottle of 2012 Carignane with some of the fresh baked bread. 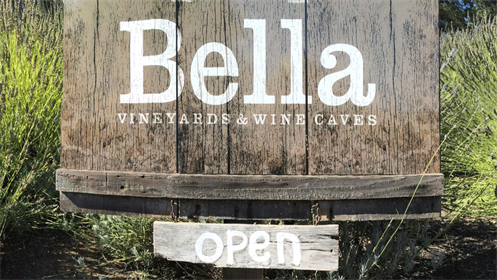 Bella’s tasting room is back in a cave and wonderfully inviting on a warm summer day. The associates at Bella are enormously welcoming. We had a non-drinker in our party and she was treated with as much attention as the rest of our party. The cave venue is memorable but the chocolate peanut butter cups dusted with sea salt (we won’t reveal their source!) 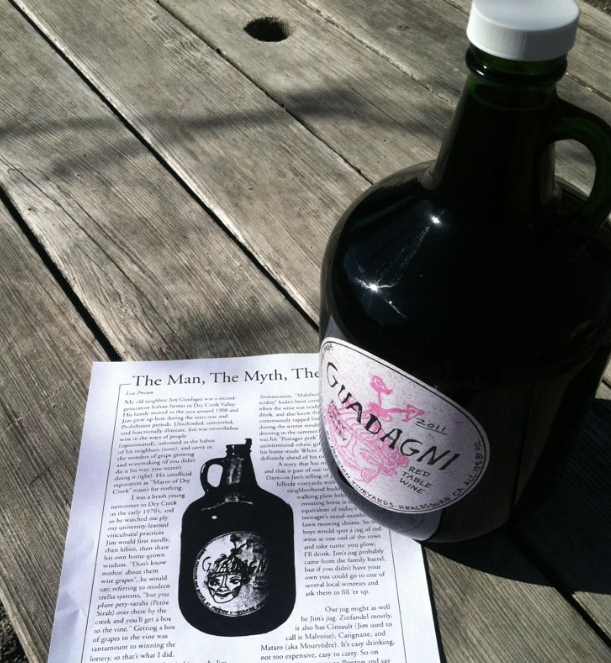 and their infamous jug wine insured our remembering Bella! 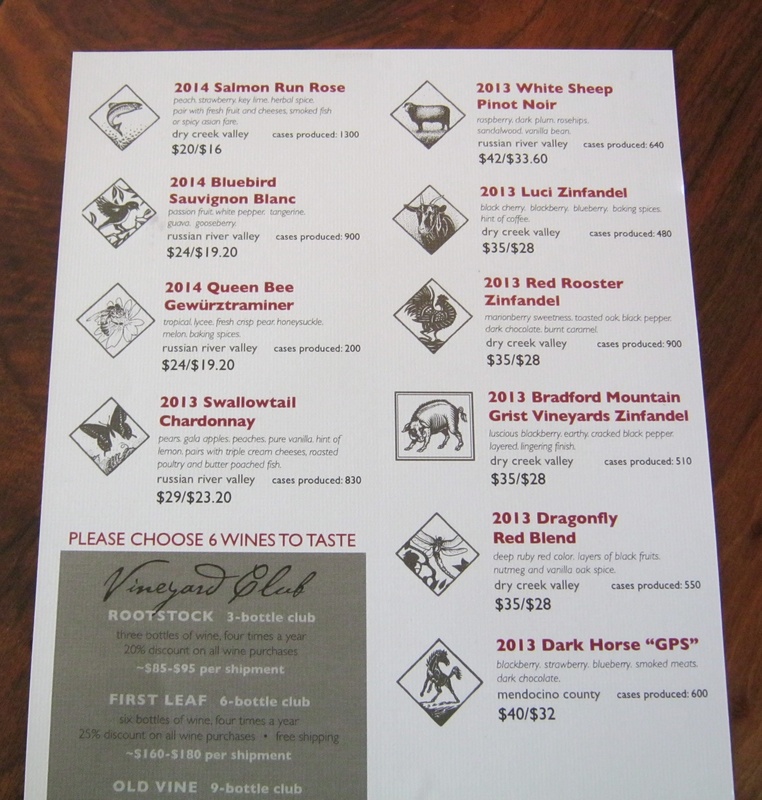 Some of the wines we tried were – a 2012 Ten Acre Russian Rriver Valley Pinot Noir which went down easily! A jammy 2012 Hills and Benches Zinfandel that played 2nd fiddle to a 2012 Two Patch Zinfandel. A 2009 Big River Ranch Syrah which had an amazing BBQ nose and the 2011 Todd Brothers Zinfandel which was incredibly inexpensive and wonderful! You can wander through gardens, sit along the creek in an adirondack chair, visit with ducks and sheep, step under the olives trees or stay at the tasting bar and interact with one of their well-informed hosts at Truett Hurst. If you are there at the right time of year you can even watch Coho Salmon spawn! It’s an attractive venue with rich variety of wines to try starting with a crisp Gewürztraminer and on into some stately zins and red blends. 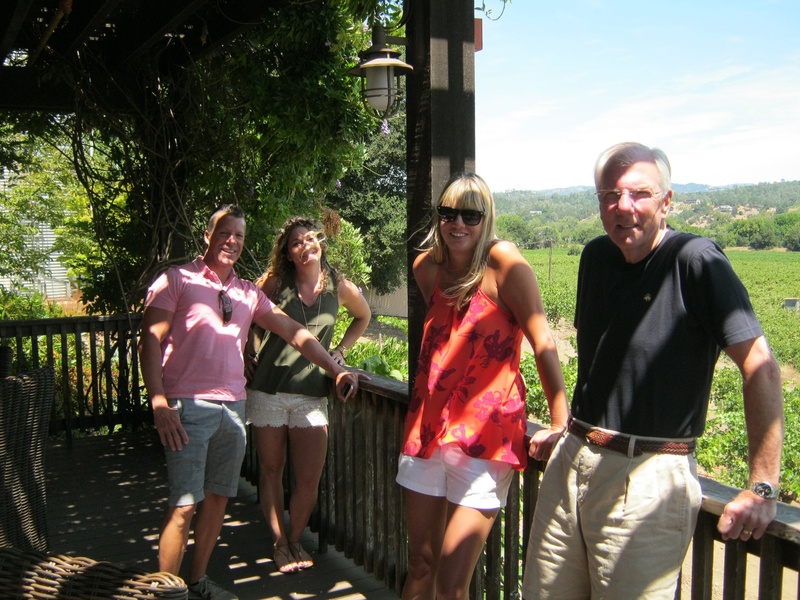 The staff encourages you to wander with your glass of wine and enjoy the place to its fullest. The 2014 Queen Bee Gewürztraminer and the 2013 Bradford Mountain Grist Vineyards Zinfandel were two favorites among our party the morning we visited. 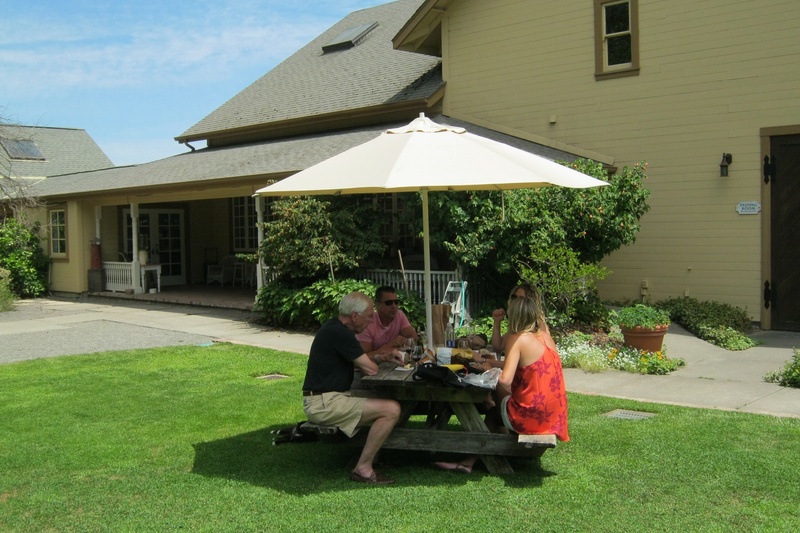 The tasting room has an impressive, well equipped stock of picnic foods to purchase including Cowgirl cheese choices so you can really settle in and appreciate what Paul Dolan and his son Heath along with Phil and Sylvia Hurst have created beside great wines! 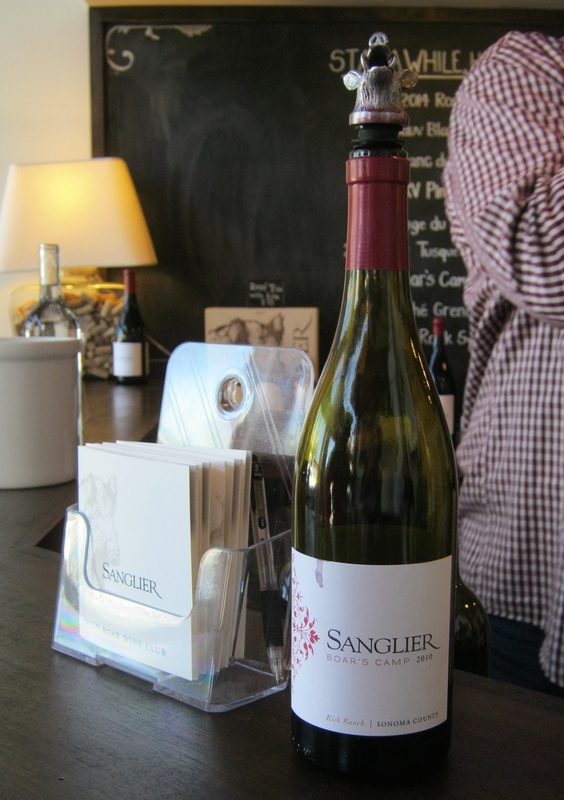 Sanglier (French for Wild Boar) has a tasting room in Healdsburg right off the square on Plaza Street. They are making wines reflective of traditional grape varietals found in Chateauneuf-du-Pape and the Northern Rhône regions of France. 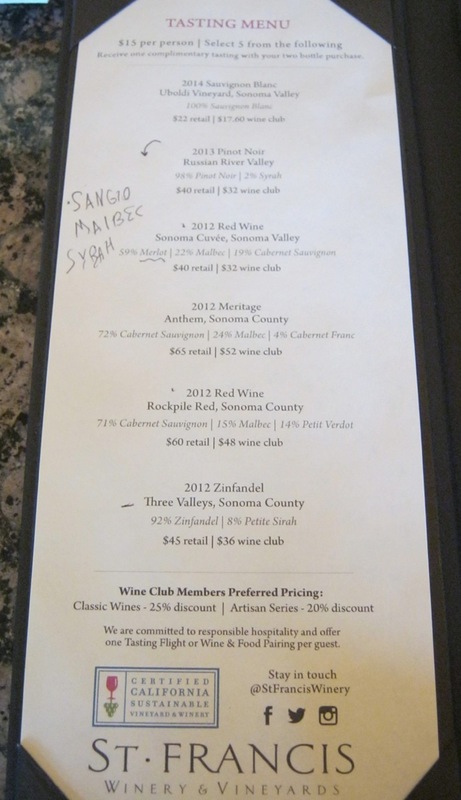 We tried a number of the wines but we were most taken with the 2012 Alexander Valley Cabernet Sauvignon – Left Tusque. 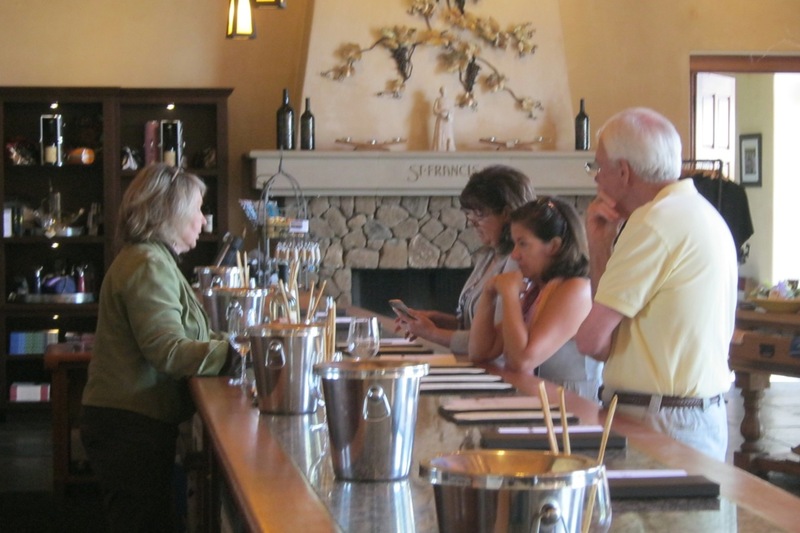 It’s a friendly tasting room that visually focuses on the winery’s character – the wild boar. There is lots of art and products depicting the ferocious guy. The best was the boar wine pourer! Wish’d gotten one! 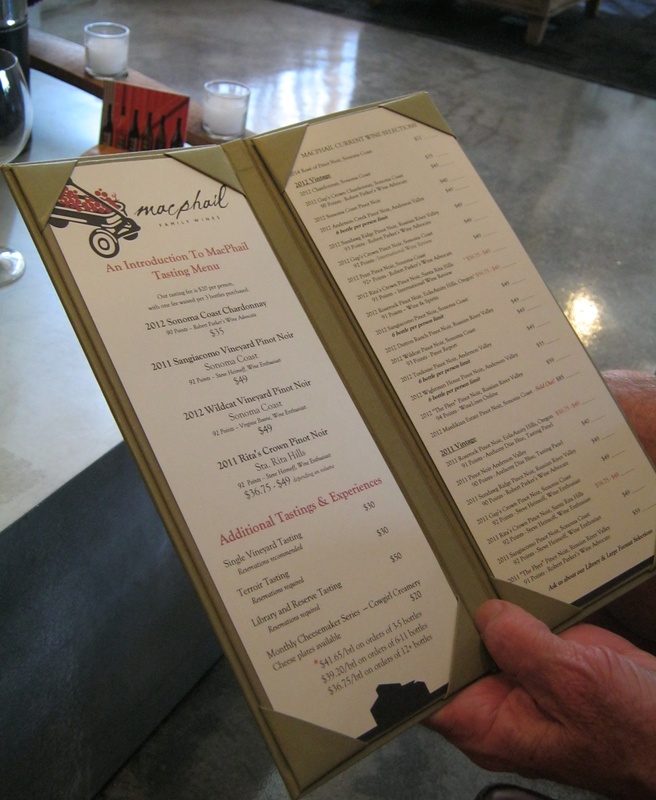 MacPhail Family Wines produces their wine in their backyard. 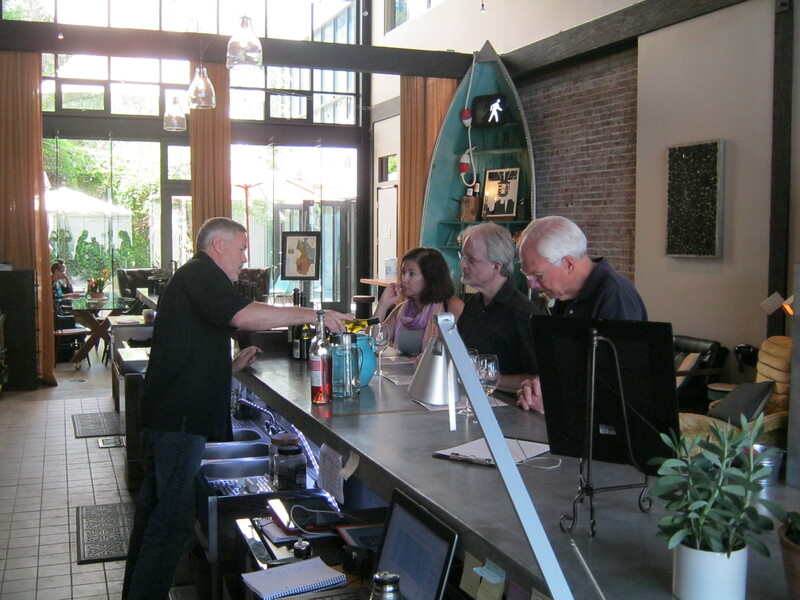 Their home and winery is in Healdsburg and their tasting room is in the very hip Barlow center in Sebastopol. 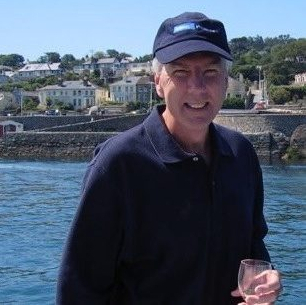 The grapes for James MacPhail’s wines come from a number of select growers in the region, and he works to produce the very best Pinot Noir possible, along with Pinot Noir a bit of Chardonnay and Rose. 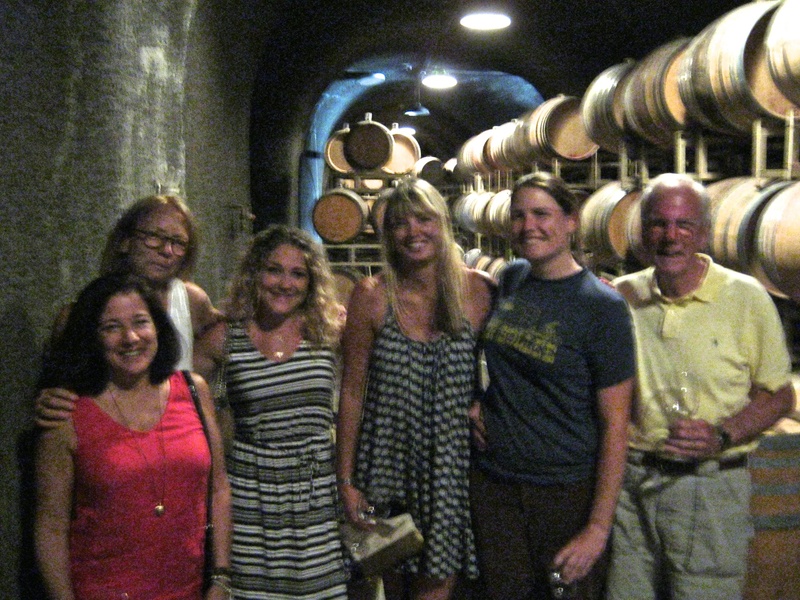 We tasted at the MacPhail tasting room in Sebastopol, in the Soil room. The back wall of the room displays the soils from the different vineyards McPhail has chosen to draw his grapes from. It’s pretty amazing. Encased behind sheets of lucite it looks kinda like a giant ant farm sans the creepy creatures! 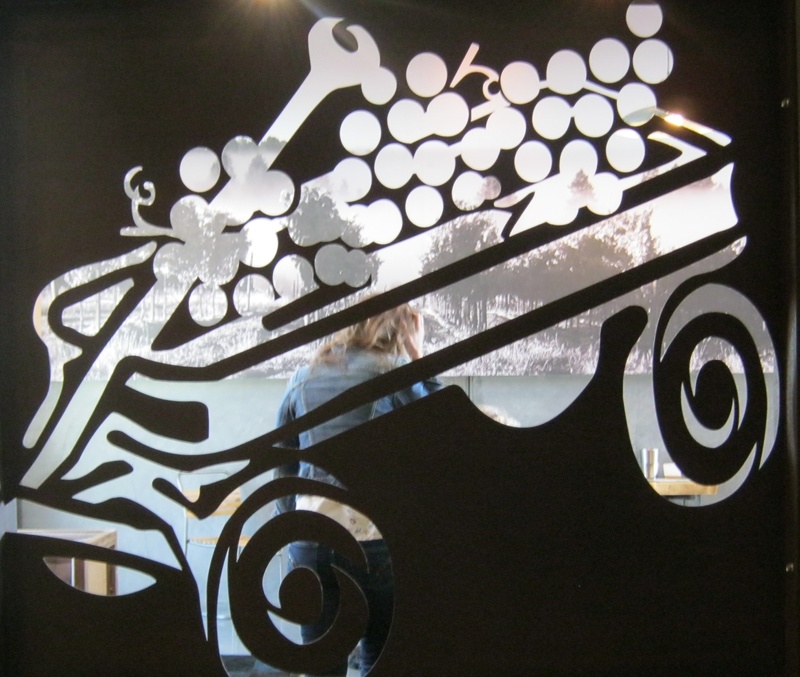 The Radio Flyer wagon is the winery logo and the visual image that clearly defines the tasting room. St. Francis Winery & Vineyards farms more than 400 acres of Certified Sustainable estate vineyards in Sonoma Valley and Russian River Valley. The facility is set up to host events, weddings and private parties forever 200 people. 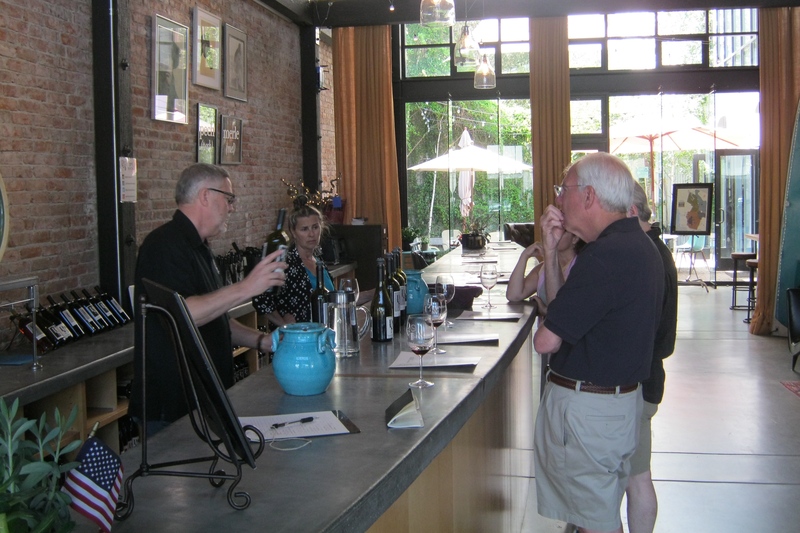 The tasting room is one of the largest we visited and is quite commercially oriented with an immense selection of wine paraphernalia and gifts. The tasting menu was generous and our host added three more to give us nine to try. Had we not been pressed to get to another appointment, we would have spent more time playing with the wines. 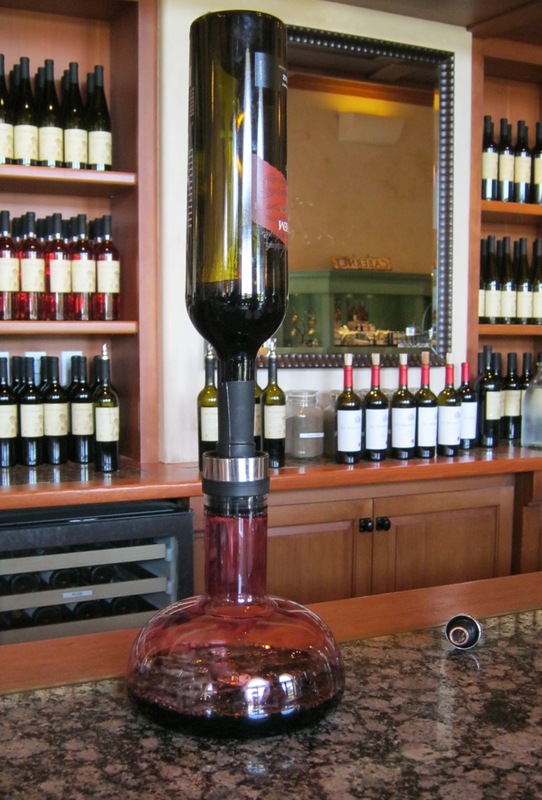 At St. Francis we were introduced to a rather clever decanter that attaches to the wine bottle allowing a perfect pour to aerate the wine then enabling a turn back over to replace the wine in the bottle to serve or to cork and take with you. 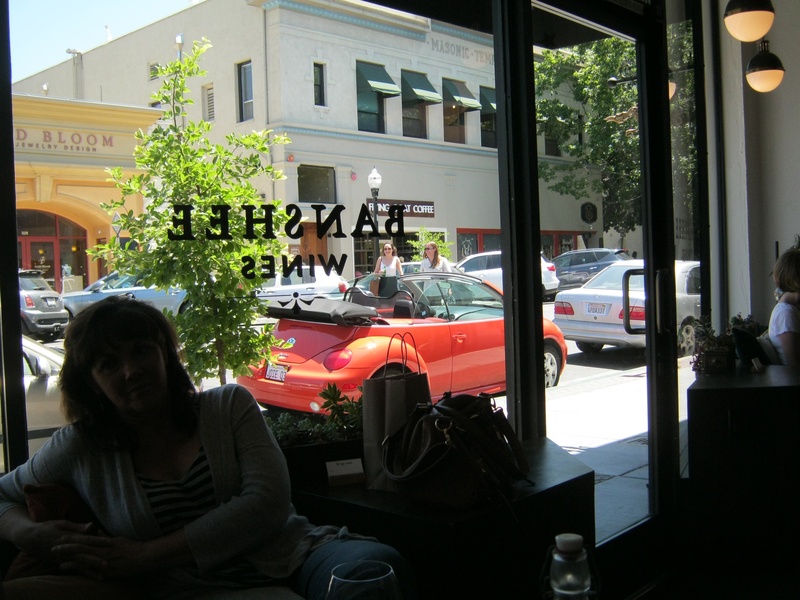 Geyserville is just up the road from Healdsburg. 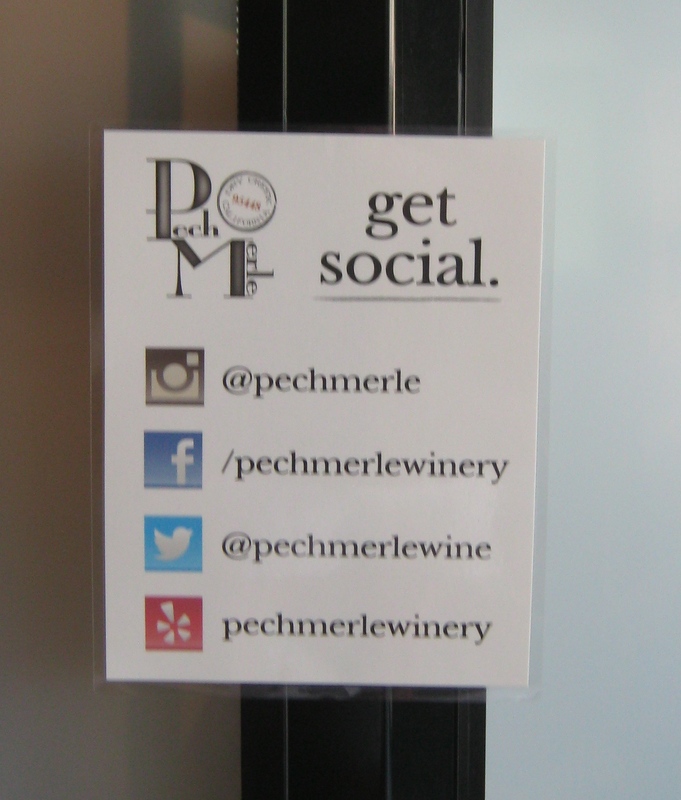 There we found Pech Merle’s tasting room on the main drag of town. We came to taste on the recommendation of our UPS delivery man who has developed a passion for nice wines. 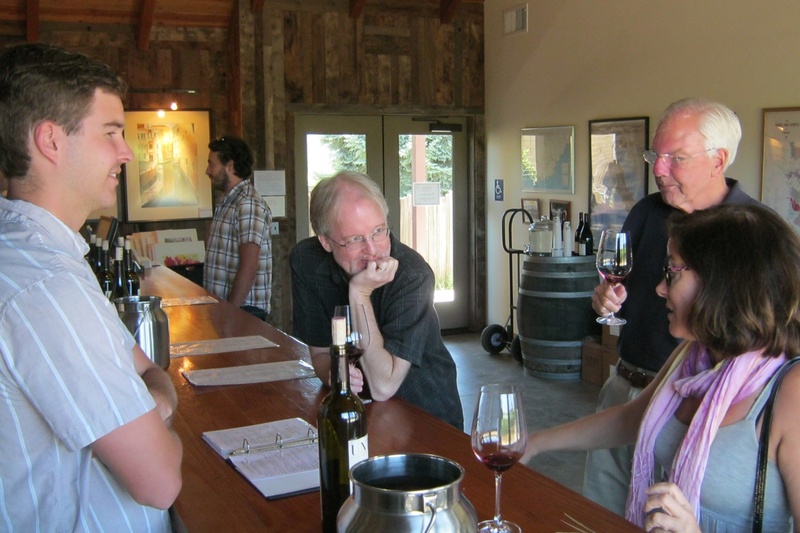 Owners Bruce and Cheryl poured for us and shared their passion and commitment to making excellent wine. 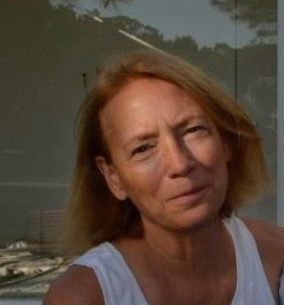 The couple has purchased land on Dry Creek Road to build a future tasting room as they are able to produce more wine and as it grows in notoriety. From what we tasted, it won’t be long! 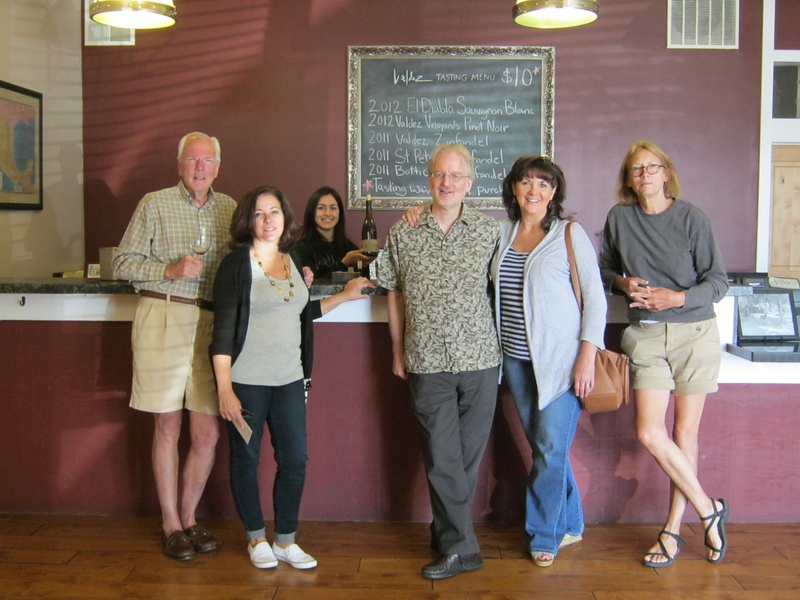 We tasted a number of their wines and purchased the 2009 Alexander Valley Cabernet Sauvignon and 2012 Alioto’s Bench Zinfandel. 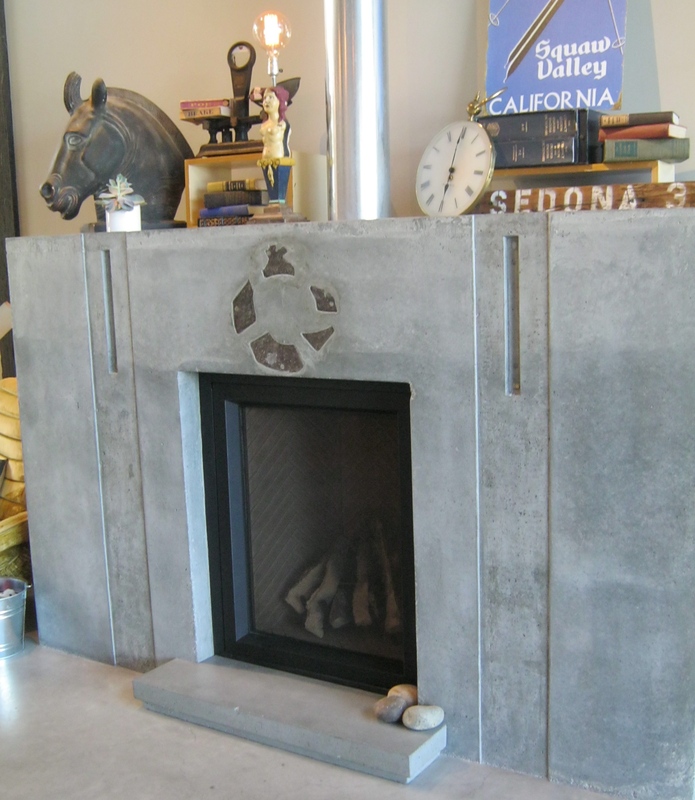 The tasting room is dotted with an eclectic, fun array of crazy, old items amidst a contemporary surrounding. I was particularly drawn to the totally unusual, funky lamp on the fireplace mantle of a two-sided bare-breasted woman. And, I am sorry I didn’t photograph the bike mounted on the wall behind the tasting bar. I’m sure that would have appealed to many. Next A Grape Grower’s Party………..